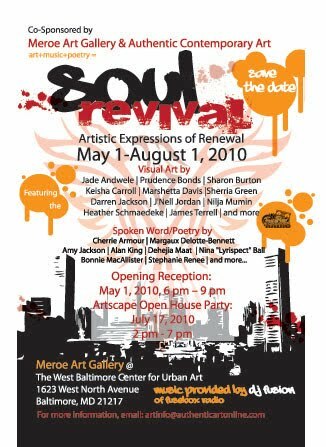 Events We Support: Soul Revival - A Poetic and Visual Experience of Renewal in Baltimore MD (July 17, 2010) | BlackRadioIsBack.com - Official Blog of the Syndicated FuseBox Radio Broadcast! In Baltimore during this year’s ArtScape? Come by and check out Soul Revival at Meroe Art Gallery on Saturday, July 17th! This exciting exhibition features emerging artists and poets based the DC/Baltimore Metropolitan area on the theme of “Soul Revival.” What do we mean by revival? We are speaking of revival of the soul, spirit, neighborhood, community, nation, and even the world. The result is a eclectic visual range of artistic expression, ranging from realism to abstract and everything in between! Selected works of from the artists work has been paired with a poet/ spoken word artist who developed a poem that expresses their view about the art. Their contributions is an integral part of the exhibition, resulting in an innovative creative representation from a variety of artists-literary and visual- of the meaning of Soul Revival! Check out the the artwork and poetry of Soul Revival here!